Rent villas in Rawai, Phuket with private pools. Book affordable holiday rentals that are near a beach. "Coral Island Villa" is a Stunning 2 Bed Private Pool Villa, Fully equipped throughout with air-con in every room & a Beautiful Shaded Outside Dining Patio overlooking the Pool. "Bon Island Villa" is a Stunning 2 Bed Private Pool Villa, Fully equipped throughout with air-con in every room & a Beautiful Shaded Outside Dining Patio overlooking the Pool. This luxury 3 bed private pool villa is extremely well equipped with beautiful outdoors dining/sitting areas and a large private pool. "Coconut Paradise Villa" is a Stunning 2 Bed Private Pool Villa, Fully equipped throughout with air-con in every room & a Beautiful Shaded Outside Dining Patio overlooking the Pool. 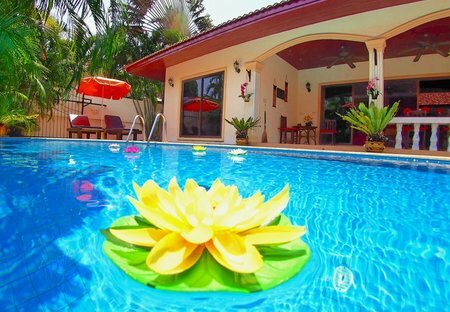 This 5 bedroom villa with swimming pool is located in Rawai and sleeps 10 people. It has WiFi, a garden and parking nearby. 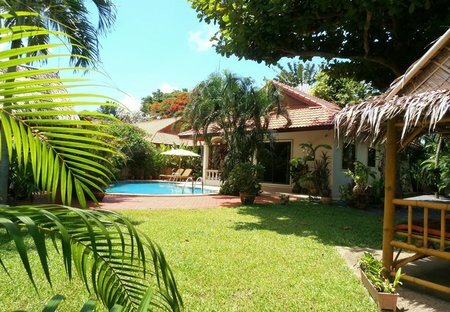 This 5 bedroom villa with swimming pool is located in Rawai and sleeps 10 people. It has WiFi, a garden and barbeque facilities. Magnificent private villa set in tropical gardens overlooking the ocean.